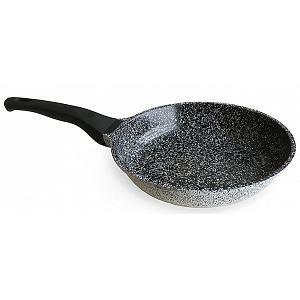 The Ultimate Pan for the Bigger Cooking Jobs! 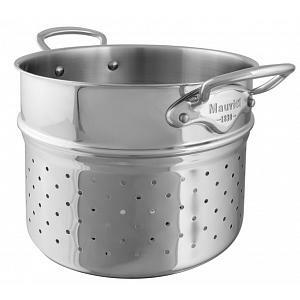 The stock pot from Mauviel's M'cook stainless steel collection is useful for anything from cooking stock, stewing tomatoes, cooking corn on the cob, and other bigger cooking jobs. The stock pot comes with a tightly fitted lid, ensuring water gets boiling faster and saving you lots of time cooking for your family. The Mauviel stainless steel stockpot offers you the highest culinary technology. 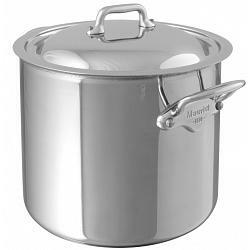 The Mauviel stockpot features a 5 layer multi-ply 18/10 stainless steel construction. Thanks to the non-drip rim, mess free cooking is guaranteed. The stock pot features a polished outside finish that is sure to stand out in your kitchen. 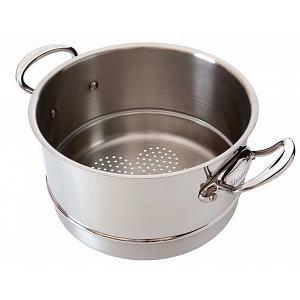 The pot and lid have stainless steel handles, securely attached with stainless steel rivets. The stock pot has a capacity of 9.2L / 9.7qt and a diameter of 24cm / 9.5 inches. The pot can be used on gas, electric, halogen, and induction stoves. It's dishwasher safe and goes into the oven too! The Mauviel stock pot has a lifetime warranty and was proudly made in France. The matching lid is included.